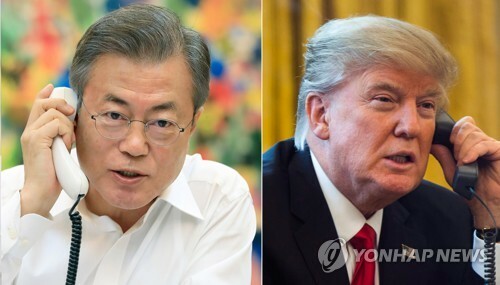 WASHINGTON, Sept. 4 (Yonhap) — South Korean President Moon Jae-in and U.S. President Donald Trump agreed Tuesday to meet during the United Nations General Assembly in New York this month, the White House said. The leaders spoke by phone ahead of Wednesday’s planned trip to Pyongyang by a South Korean government delegation headed by Moon’s chief national security aide, Chung Eui-yong. The trip is aimed at setting the date for Moon’s third meeting with North Korean leader Kim Jong-un, which the two sides agreed earlier would be held in Pyongyang this month. It comes amid growing skepticism that Kim is serious about giving up his nuclear weapons program despite his commitment to the “complete denuclearization” of the Korean Peninsula during his first meeting with Moon in April and again at the Singapore summit with Trump in June. “The two leaders discussed the latest developments on the Korean Peninsula, including our ongoing efforts to achieve the final, fully verified denuclearization of North Korea as agreed to by Chairman Kim Jong-un,” White House press secretary Sarah Sanders said in a statement. “They agreed to meet later this month on the sidelines of the UN General Assembly in New York,” she added, without elaborating on the date. South Korea’s presidential office, Cheong Wa Dae, noted in a separate readout that the leaders agreed to consider a meeting at the U.N., but stopped short of saying it would happen. Moon was quoted as telling Trump that an improvement in South-North relations would contribute to complete denuclearization and the establishment of permanent peace on the peninsula. Chung told reporters the same day that he will carry a letter from Moon to Kim. He also said he hopes to meet with the North Korean leader, but that such arrangements have yet to be finalized.